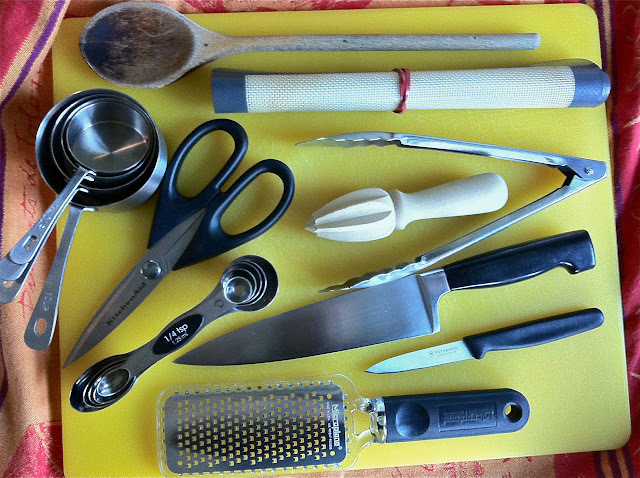 Kitchen utensils: my tools of the trade. Share yours? I’ve got a small kitchen, but it’s an exceedingly practical one. Whether I’m grabbing a bowl or a pan, a knife or a cutting board, moving from sink to fridge to the stove — or reaching for spices — I rarely have to take more than two steps. Four at most. This morning, I was thinking that with Thanksgiving only two weeks away, many of you might be wondering what kind of tools you’ll need to outfit your kitchen. But what I’m curious about are the ones you use most frequently, throughout the year. Here are mine, laid out on my favorite kitchen towel and cutting board. I use my citrus reamer way more than I thought I would. And how I lived before owning a solid pair of kitchen shears and a silicone mat (that’s the Crate & Barrel version) is beyond me. That Microplane (I have several) is “grate” for everything from grating Parm to zesting lemons. And no matter how many fancy kitchen tongs I’ve seen in specialty shops or used at friends’ houses, none beat the utilitarian 9-inch restaurant-grade tongs in this photo, which I’ve cooked with for at least a decade.